A representative for the West 3rd Street McDonald's where a shocking attack occurred questioned police coverage of the area at a community meeting on Oct. 27, 2011. 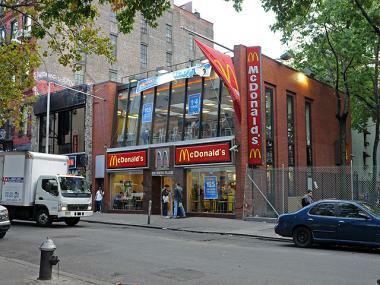 GREENWICH VILLAGE — A rep for a West Village McDonald's where a staffer was caught on tape attacking a pair of customers confronted NYPD officials this week over a debate regarding who is responsible for patrolling the troubled location. Maritza Reveron, marketing manager for the fast-food chain's West 3rd Street location, told those present at Wednesday night's 6th Precinct Community Council meeting that she's troubled by the NYPD's assertion that the store should be responsible for its own security. "As we're looking for solutions on how can we get more [security] coverage, a lot of it seems to be 'Figure it out on your own' or 'Pay for it,'" Reveron said at the meeting. Police sources told DNAinfo earlier this month that McDonald's management chose not to hire off-duty NYPD officers to patrol the restaurant because it "wasn't in their financial interest." Police reiterated at the meeting Wednesday that they had limited manpower and that they were staffing the McDonald's to the best of their ability. They also asked Reveron once again whether the eatery planned to hire private security. McDonald's employee Rayon McIntosh, 31, is being held on felony assault and weapons possession charges in connection to the Oct. 13 incident. He was caught on camera beating two female customers who charged the counter after a fight over their order. Denise Darbeau, 24, and her friend Rachel Edwards, 24, were charged with trespass. Darbeau had her skull fractured and needed 20 staples in her head, her father said. The West 3rd Street McDonald's once employed a security guard, Reveron confirmed, but would not say when that policy ended or why. The store has been plagued with violent outbreaks, including a March 27 assault on 22-year-old Damian Furtch, who was beaten as he walked out of the restaurant. Reveron suggested that police should patrol West 3rd Street more thoroughly, rather than ask the restaurant to hire its own security. "We're taxpayers here, too, and we want to make sure we can offer our staff and our customers a safe environment," Reveron said. She did acknowledge "some incidents at our store," but blamed violence there on area nightlife. Sixth Precinct Lieutenant Maresca agreed that Village nightlife creates crime and quality-of-life issues. "[The Village] is a nightlife destination, and we run into a lot of issues," he said. "Unfortunately, with the volume of people we get here, it's tough. It's tough on the residents, and I understand that. And we can't have a cop every place we want the police officers to be." Maresca said the precinct has 18 officers in its "cabaret unit," four of whom patrol Bleecker, MacDougal and West 3rd streets in the central Village. Those officers also cover Sixth Avenue, he said. Other officers in the precinct's cabaret unit are responsible for covering the Meatpacking District and Christopher Street, Maresca said. "We try to evenly space them out between all of the high-priority [nightlife] areas," he said. In the 1990s, the Village had a much larger cabaret unit, of 75 to 80 officers on weekends, Maresca said. "The precinct is notably smaller now," he said. Franchise owner Paulino Foods, which owns the West 3rd Street McDonald's, did not respond to an inquiry about whether it plans to hire a security guard for the location.